Sweep away oil and shine with the NIP + FAB Salicylic Acid Day Pads from the skincare and makeup label’s best-selling Teen Fix range aimed at oily, blemish-prone skin types. Supercharged with powerful antioxidant and antimicrobial agent Wasabi extract, the breakout-fighting range helps to remove acne-causing bacteria, control sebum production and zap spots. The single-use pads are infused with blemish antidote Salicylic Acid and Lotus Flower extracts, which work in synergy to decongest pores and calm inflammation. Aloe Vera deeply moisturises skin, leaving you with a complexion that’s calmer and clearer for the day ahead. Wipe one pad over entire face. 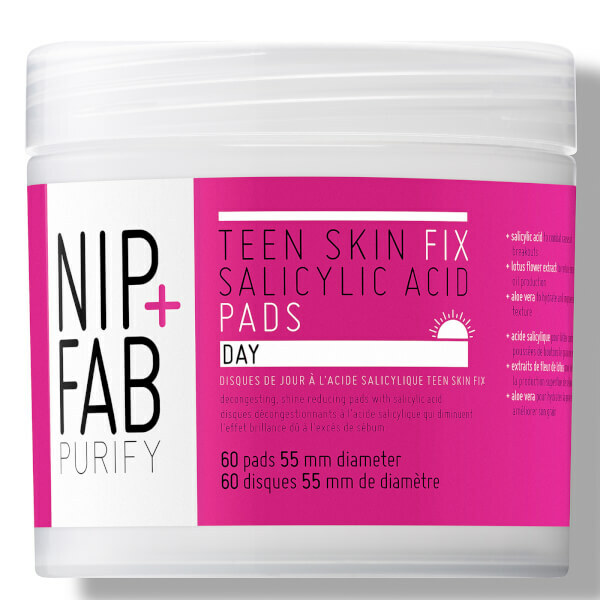 Use every morning, follow with Teen Skin Salicylic Acid Night Pads in the evening. Use 2-3 times weekly on sensitive skin. Avoid direct contact with eyes. If eye contact occurs, rinse well with lukewarm water.